Solar water fountains can be that little bit of extra something that will bring life and dynamics to any garden or outdoor area. 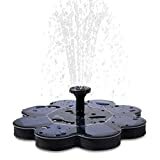 Most of these fountains are pretty versatile and can be used in a swimming pool, bird bath, or pond, and are an inexpensive way to accent and decorate the garden or patio space. You don’t have to plug them in. Just set them in the water, and off they go — though buyers should understand that these units need direct sunlight to work. After a complete look at the market, we have determined that the Best Solar Powered Water Fountain is the TekHome 1.6W Solar Fountain Pump [Amazon link]. TekHome 1.6W Solar Fountain Pump, Solar Bird Bath Fountain Pump, Solar Powered Bird Bath Fountain, Solar Water Fountain for Bird Bath, Solar Panel Pump, Small Floating Fountain for Garden Pond Pool. This week’s PatioZen is all about water. In this article, we will look at several different pondless water features for patios and garden areas, and consider how these work in their environment. Water features provide stimulation to the senses. The sound of the water rushing through the environment, and of course the visual interest the water provides are the most significant sensual impacts of a water feature. But there is also the touch of water mists hitting those around the waterfall, the taste of water, and the smell of the change in moisture levels.